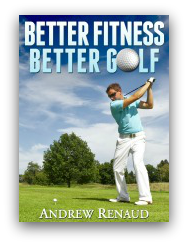 A BOSU ball is a relatively new way to mix things up with your golf strength training program. If you are unaware of what a BOSU ball is, it is essentially half of an exercise ball on a platform. Both sides of the device are able to be used to add a level of instability to your workouts. The BOSU Balance Trainer came to the market in 2000 and have quickly become a mainstay in athletic training rooms and physical therapy clinics. The term BOSU stands for "Both Sides Utilized". The greatest aspect of a BOSU workout is the wide variety of exercises that you can perform using the trainer. While you will probably use the device more with the ball side up, there are plenty of challenging exercises with it oriented the other way. It can be used to train both the upper and lower extremities. Also, there are some very challenging core exercises that can be performed. A BOSU will use many different muscles in order to help you stabilize and keep balance. Even performing an exercise as simple as stepping up onto the ball will recruit more muscle fibers than just stepping up to a step alone. Your ankle will need to work overtime as the first line of defense as your weight shifts to the leading leg. You also will get your gluteal muscles firing to help control the femur and knee. I didn't actually begin to use a BOSU trainer until I started a new job a few years ago. I honestly didn't quite know what to think of it initially because I had no significant prior experience with it and was unsure what type of patients to use it with. 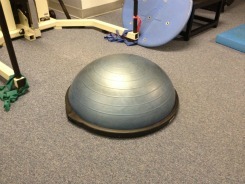 Well, hundreds of patients later, I have a much better idea of who to perform BOSU exercises with. Practically everyone! I use a BOSU trainer with post operative patients such as total knee and total hip replacements to challenge their sense of balance with an uneven surface later on in their rehab. Knee injury patients, whether it's an ACL injury or something more common like patellofemoral syndrome, benefit in order to improve general lower extremity strength. I have also used the ball with shoulder patients to change up their routines. This is just a small sampling of the patients I use a BOSU with. If you are looking for something new to add to your golf fitness routine, please consider BOSU workouts! But what about the other group of people, those who shouldn't use a BOSU ball? First of all, I think that beginners should be extremely careful when initially attempting these exercises. I think its a good idea to familiarize yourself with some more traditional exercises prior to using this device. Also, many gyms will have foam pads, which can be a easier alternative to a BOSU but will still provide the benefits of instability. Also, elderly or those with poor balance really shouldn't even attempt these exercises without close supervision from a trained fitness professional. Remember, safety is always the first priority! The golf fitness training model set forth by the National Academy of Sports Medicine uses BOSU exercises in the strengthening-stabilization portion of the training schedule. I strongly agree with this assessment because I think that a BOSU trainer is a great way to work on the muscles that primarily stabilize your joints. The strengthening-stabilization component comprises the beginning portion of your overall training program where you are trying to prepare your body for more advanced strength training down the road. Joint stability is crucial, especially once you start lifting heavier weights or trying something more advanced such as plyometrics. The instability that these balls provide causes multiple muscle groups to fire at once which will help develop general strength at the joint. I do not think that a golf strength training program should include an overwhelming number of BOSU exercises but find a handful of ones that you like and are effective, and then you can rotate them in and out of your training. While they are great for what they are intended for, there are times when you need a stable surface so that you get develop power and strength in specific muscles. Once you move on to more advanced power development, you will move away for BOSU balls and utilize medicine balls much more.